A lot of golf fans who watched Francesco Molinari's triumph at Carnoustie noticed something about his gear. Namely that, though he wore Nike logos on his clothing, none of his golf clubs carried the iconic swoosh. That's because Nike Golf decided to quit the golf club business two years back and decided to focus on apparel and shoes instead. That allowed a bunch of Nike-sponsored pro golfers like Molinari (as well as fellow 2018 major winners Brooks Koepka and Patrick Reed) to seek out new clubs to swing on Tour. Molinari is back in action this week following his victory at the Open Championship, and the newly minted major champion was asked about the process of finding new clubs during his press conference prior to the start of the WGC-Bridgestone Invitational. "When Nike stopped making equipment, I just took it as a chance to test as much as possible and to find things that would help me improve my game. It wasn't easy because it was a lot of work, especially for someone like me that had been 12 years with Nike. I didn't know what was out there, so it's taken a little time to go through the testing." 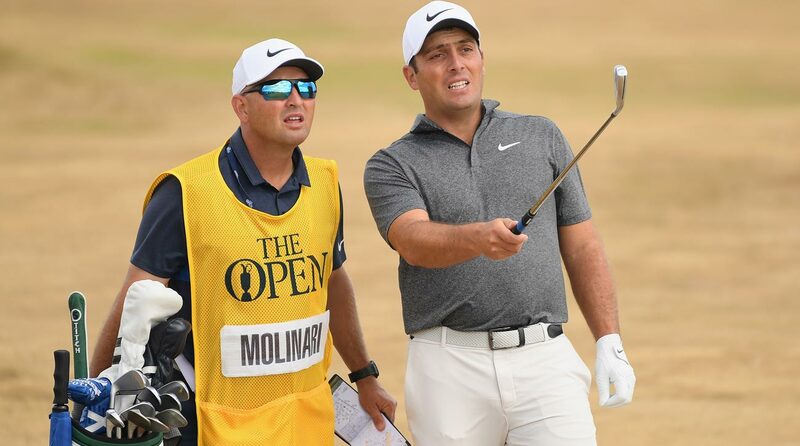 Francesco Molinari discusses a shot with his caddie during the 2018 British Open. Then a reporter asked Molinari if the ability to play any clubs he wanted was "freeing." He instead chose to point out the downside of his situation, and what he misses most about playing Nike equipment. "To be honest, it made me realize as well how good of support I was getting from Nike and the guys building the clubs," Molinari said.